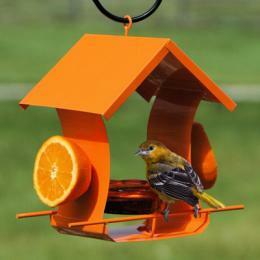 Woodlink Orange Metal Oriole Feeder. Get ready for the Orioles with this Woodlink quality variety food center for Orioles and other nectar loving birds. Orioles will enjoy the jelly dish as well as the orange halves that will be available for these nectar eating colorful birds. The orange color house shaped bird feeder is a magnet for orioles. Use the the ends of the perches to add more oranges for more bird feeding. An exciting design! Capacity 1 jelly dishes, 2 Orange halves.